Mount Carmel is a Holy Land mountain located in a richly forested area at the southern end of a long fertile valley inhabited since the Stone Age. The beauty of the mountain is frequently mentioned in the Old Testament. The feast day we now celebrate on July 16 recalls the foundation of the Carmelite religious order in the 12th century. The founder built a small chapel at the top of Mount Carmel dedicated to the Virgin Mary. According to Carmelite tradition, a scapular – a small piece of rough wool cloth – was given in a vision by Virgin Mary on July 16, 1251. Mary appeared with the small scapular in hand. Promises associated with the scapular include Mary’s protection especially at death. Of all the types of scapulars the best-known, and most popular, is the Scapular of Our Lady of Mount Carmel, sometimes referred to as the Brown Scapular for the color. 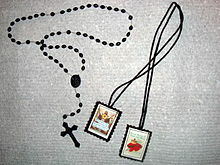 The wearing of a devotional scapular is viewed as a constant meditation. 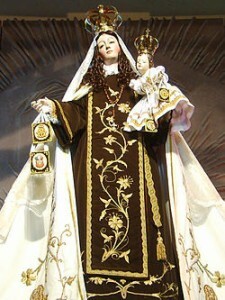 Statues of Our Lady of Mount Carmel are easy to recognize by being a rare image of Mary presented in brown. 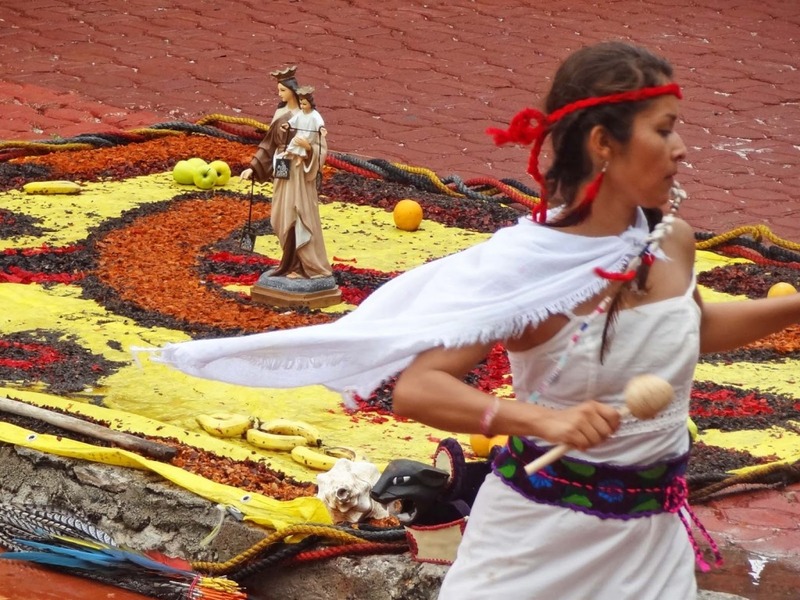 She carries baby Jesus and a small scapular, in addition to wearing a full-body scapular favored by the Carmelites. Following 6 AM fireworks very day for a week mass is said at 7AM and a rosary at 7PM. Plus there is a week of musical and dance entertainment in her honor throughout town.